We know not why fashion and etiquette should be considered exclusively feminine; both ladies and gentleman mingle in the great arena in which fashion is supposed to be displayed, called society, and certainly no lady will deny that her studies of the arts and graces taught by fashion would be deprived of all or at least half their charm, if they were not destined to be displayed as much for tho benefit of tho gentlemen as the ladies. 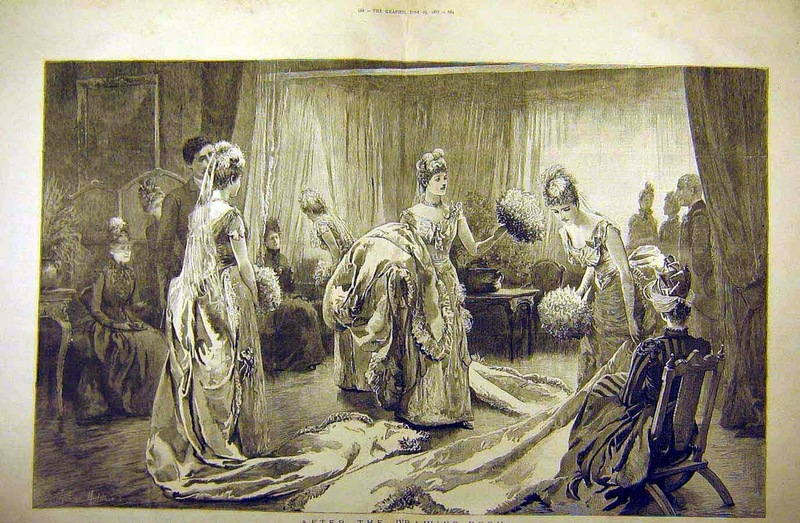 On entoring a drawing-room where there is an evening party, you first pay your respects to the lady of the house. You ought not to address even your most intimate acquaintance previously, unless you happen to arrive late, and the hostess is out of sight; in that case, you may converse your way up to her. Remember that in company all have an equal claim on your respect, though interest or inclination may regulate tho different degrees you show to each. It is very disrespectful to your entertainer to shun any of the guests; all that are invited should be deemed worthy of your acquaintance. Should you, in the drawing-room of a lady, meet a gentleman to whom you have never been introduced, it would be perfectly correct for you to converse with him as if he wore known to you—the ceremony of introduction being nothing more than the guarantee of a mutual friend, that two gentlemen are, by position and manners, eligible acquaintance for each other; and this is to be inferred from tho fact that both meet at a respectable house. It is, however, according to rule, that you take the earliest opportunity of being presented to such a one. Never go into society with your mind absent or preoccupied. Men of solitary habits and meditative dispositions are unfit companions for the gay and sprightly. You go into tho world to unbend the mind; leave, therefore, grave questions and perplexing disquisitions in your closet, when you go forth among tho pleasure-seeking, the young, and the happy. It is the practice of some men to abstain from all conversation with a woman, except that which is of a light and trifling nature. With the very young and thoughtless, this may be judicious enough; but, with women of sense, whether youthful or middleaged, married or single, you may venture to introduce topics of discourse both rational and elevated. Do not fear that by touching on subjects of graver, deeper interest than the merits of a favorite actress, or the figure of the newest polka, you will be soaring a flight beyond the reach of their intellect. To talk to a mother about her children, to praise them, and manifest an interest in them, is very safe ground. It is also judicious, in visiting at a house a where there are any miniature men and women, to conciliate their good will; you will else hardly be welcome visitor to mamma. Never tell a woman that she is handsome, but leave her to infer, from your manner, that it is so. If you have a penchant for any particular lady, do not suffer it to be so marked as to be offensive to others; thus, be not neglectful of other ladies, by suffering your attention to be wholly engrossed by one- and be not afraid to pick up a fan, or restore a pocket handkerchief to a fair guest, even though the eye of your intended marks all your movements. Politeness is due alike to all, while in society – exclusive devotion is for home practice, for private manifestation alone. When you intend to quit a ball, a concert, or an evening party, before the others break up, take your departure without naming your intention to any one, and, if possible, without being seen.